How Do I Edit my Meals in the Bodybugg? The most common first question I get with the bodybugg application is, "I’ve entered my food, now I want to go back & change it & I cant." As far as editing the food log, yes you can do it & it’s easy; it just happens in a different place than where you initially log your food. I agree that it’s a little confusing. You click the “Calories Consumed” button when you’re entering in new meals, but not when you’re modifying previously entered meals. 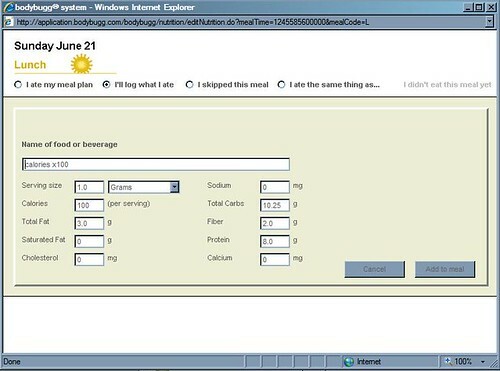 Step 1: Using the Date selector, select the date for the food you want to modify. Step 2: Select the “Nutrition” sub-tab just below the “Calories Burned”, “Calories Consumed” buttons & just to the left of the Calories Burned graph. Once you’re on that sub-tab, you can edit any meal by clicking the “EDIT” button associated with the meal you’d like to change. 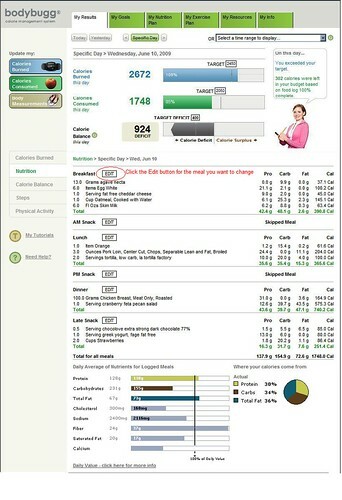 That being said, I understand that it’s a pain to start a new food logging tool; If you already have been using another tool like The Daily Plate or SparkPeople, you probably have most of the foods that you eat on a regular basis in that other food logging application, & you don’t want to have to find them in a new database or enter them again into the bodybugg system. On average, we all eat the same 100 foods, so if you’re willing to put up with the inconvenience for a bit, it will get easier. Otherwise, I have a possible workaround. 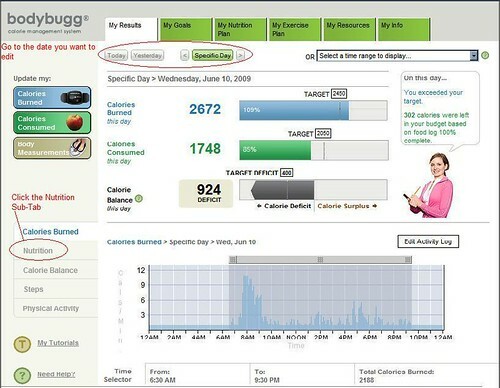 What I suggest as a workaround is to keep logging your food in your other food logging application & then just reporting the calories in bodybugg. I wrote a blog post about this technique. 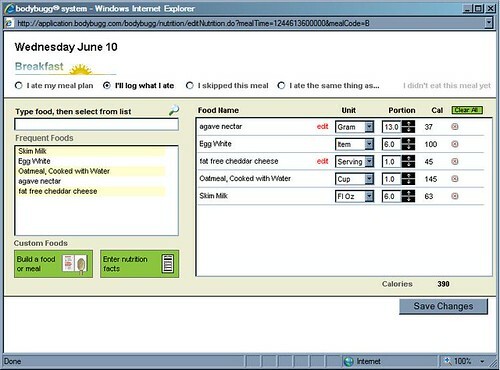 Create a custom food in bb called "calories" which is 100 calories & a unit of measure of 1. Once you know what your total is for the day, (given that you’re not overly concerned about macronutrient breakdowns) just enter one food called "calories" & have it total the amount of that day from your other food logging application. So let’s say that you logged 2453 calories in My Food Pantry for Monday. When you get to enter your food in for Monday, instead of duplicating your food log, enter one food for one of your meals (calories) and the unit is 24.53 which would total 2453 calories for the day. I don’t suggest that your "calories" custom food =1 calorie because there’s a 3 digit limit to your number of servings in the bodybugg application. What this means is that if you have a meal or day greater than 999 calories, you have to add it to multiple meals since you can’t add the same food to the same meal twice. Copyright Elizabeth Sherman. Purchase a Bodybugg through Elizabeth Sherman.